Welcome to the Spiritual Warlord series! 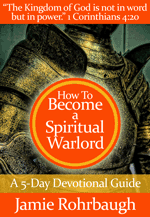 Did you know that YOU are called to be a spiritual warlord in the Kingdom of God? True story! Christians aren’t called to be under the weather, under attack, or under the circumstances. We’re called to dominate in our spheres and release the will and purposes of God on the earth. This series will help you begin to do just that! 1. 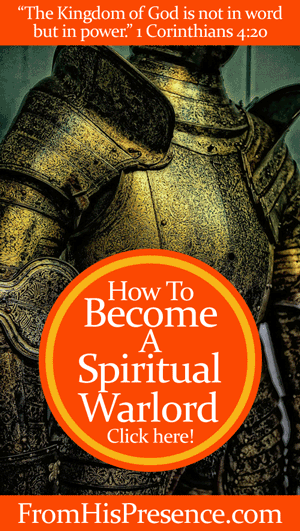 How To Become A Spiritual Warlord: The Kingdom of God is not in word but in POWER. Read what that looks like here! 2. The Word Of The Warlord: If you want to be a spiritual warlord, here’s THE most important thing. It’s something everyone can do, starting today. No prior experience required. 3. The Weapons Of The Warlord: If you’ve ever been through proverbial hell, you’re qualified to be a warlord. Here’s why. 4. The Warfare Of The Warlord: Warlords fight their battles differently than other people. Their warfare actually works. Here’s how to win every battle, every time. 5. The War Cry Of The Warlord: ONE motto makes the difference between a weak, powerless Christian and a warlord who dominates. Read this post to learn what the motto is! This e-book will kick-start your devotional life with power. So click the button below to grab the Spiritual Warlord devotional guide e-book on my Gumroad store!